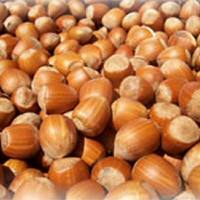 Description: Like many nuts, hazelnuts have been grown and enjoyed by many for thousands of years. In 1995, evidence of hazelnut processing 9,000 years ago was found in Scotland where concentrated burnt hazelnut shells were discovered in a pit. The evidence suggests that the nuts were harvested in a single year and that the hazel trees were cut down within a single year. In addition, Romans were heavy cultivars of hazelnuts. The first widespread cultivar of hazelnut, the Kentish cobnut was introduced in 1830. Today Turkey, Italy and the U.S.A. are the top three producers respectively with Turkey being the top producer by a large margin. Hazelnut is any species within the genus Corylus and is very closely related and sometimes even referred to as the filbert. The common hazel is the kernel of the seed and grows on deciduous shrub which can grow to be a tree depending on the type. The shrubs leaves are an important provider of food for many animals. When ripe the nut falls out of its fibrous husk, which typically happens 7-8 months after pollination. The shell is round, smooth, and colored a light brown. Hazelnuts are often used as a confectionary for chocolates or pralines and are often grounded into a paste like in nutella, the popular spread. They are known for their sweet taste which is often used in salads and has even become a popular flavor of coffee. The oil from the hazelnut has been used in medicine and aromatherapy. Kitchen Pharmacy: Hazelnuts are tremendous for providing energy and have proven to help lower cholesterol, especially the bad cholesterol. In addition, its high folate levels help prevent birth defects and are believed to help certain types of cancer. Nutrient Information: 10 Whole Pieces.